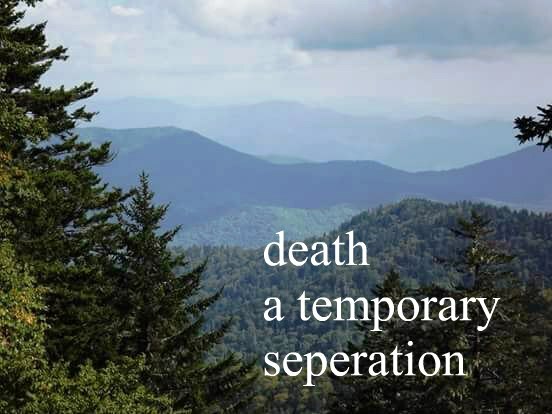 Death,a temporary separation – I Am Not Ashamed Of The Gospel Of Christ! When a loved one dies it is inevitable our heart is filled with sorrow from our loss,but for a christian death is only a temporary separation till they see their loved one again.Our Lord has conquered death and we know to be absent from our body is to be present with the Lord! (2 Corinthians 5:1-9). For we know that if our earthly house of this tabernacle were dissolved, we have a building of God, an house not made with hands, eternal in the heavens.2 For in this we groan, earnestly desiring to be clothed upon with our house which is from heaven:3 If so be that being clothed we shall not be found naked.4 For we that are in this tabernacle do groan, being burdened: not for that we would be unclothed, but clothed upon, that mortality might be swallowed up of life.5 Now he that hath wrought us for the selfsame thing is God, who also hath given unto us the earnest of the Spirit.6 Therefore we are always confident, knowing that, whilst we are at home in the body, we are absent from the Lord:7 (For we walk by faith, not by sight:)8 We are confident, I say, and willing rather to be absent from the body, and to be present with the Lord.9 Wherefore we labour, that, whether present or absent, we may be accepted of him. We have the promise of eternal life if we believe Jesus died and rose again,and we know death has no power over a believer but only death from this life will we sleep until the Lords return! (1 Thessalonians 4:13-18). 13 But I would not have you to be ignorant, brethren, concerning them which are asleep, that ye sorrow not, even as others which have no hope.14 For if we believe that Jesus died and rose again, even so them also which sleep in Jesus will God bring with him.15 For this we say unto you by the word of the Lord, that we which are alive and remain unto the coming of the Lord shall not prevent them which are asleep.16 For the Lord himself shall descend from heaven with a shout, with the voice of the archangel, and with the trump of God: and the dead in Christ shall rise first:17 Then we which are alive and remain shall be caught up together with them in the clouds, to meet the Lord in the air: and so shall we ever be with the Lord.18 Wherefore comfort one another with these words. There are two excellent examples man lives on after death in the book of hebrews,as seen of Abel and Enoch (Hebrews11:4-5). 4 By faith Abel offered unto God a more excellent sacrifice than Cain, by which he obtained witness that he was righteous, God testifying of his gifts: and by it he being dead yet speaketh.5 By faith Enoch was translated that he should not see death; and was not found, because God had translated him: for before his translation he had this testimony, that he pleased God. The Lord is near unto them that are of a broken heart;and saveth such as be of a contrite (crushed) spirit (Psalm 34:18). Fig Tree Generation, Negassi Bereke, Trish …..HE is our life and comfort in times of need. God Bless You.